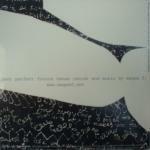 The first single from Magne Furuholmen's forthcoming album "Past, Perfect Future Tense" is the title track. 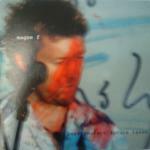 This 1-track promo release features a colour close up shot of Magne with some large black handwritten letters on the right hand side. The title has been printed in black in the bottom right hand corner and "magne f" is printed in white towards the top left of the sleeve. The reverse of the sleeve is white with two black irregular shapes cutting across from the top and bottom. White handwriting can be seen over the black parts of the sleeve. The title is printed in black across the middle of the sleeve. The disc is white with the title printed in small black letters just below the centre. Some copies of the promo come with a promo press sheet.